I have two small children ages 25 months and 10 months. They are both still in diapers! I’m sure you can imagine how many diapers we go through in a day or even a month!! I pondered the thought of cloth diapers…..but then the thought of ALL that laundry hit me! I have enough laundry and find myself buried in it most days! So disposable is the way to go for us. I just needed to find some inexpensive disposable diapers! Then we found Fisher Price diapers! I read some reviews of them and decided to give them a try! They have “Happy Days” and “Happy Nights”. 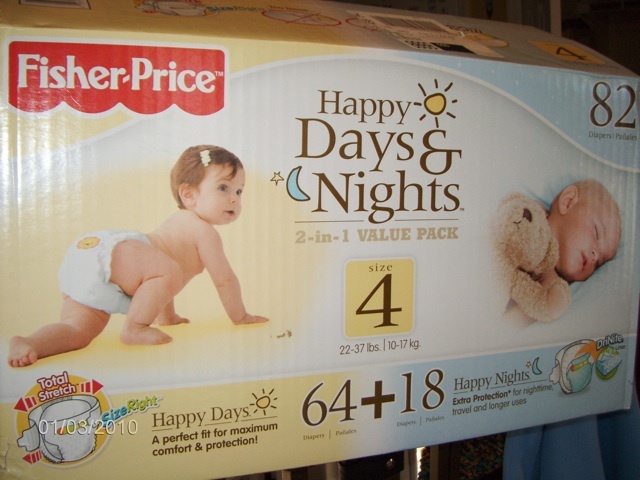 Nighttime diapers are what we really need. It’s no fun for poor Sibylla to wake up cold and wet in the middle of the night! Well we are on month two of Fisher Price diapers! Everything seems to be going well! They stay dry all night for both kids! They are not too bulky or rough! And the ARE less expensive than other name brands!